The Model Design Manual for Living Streets is now available to download. To download, please use the button on the right hand side of this window. 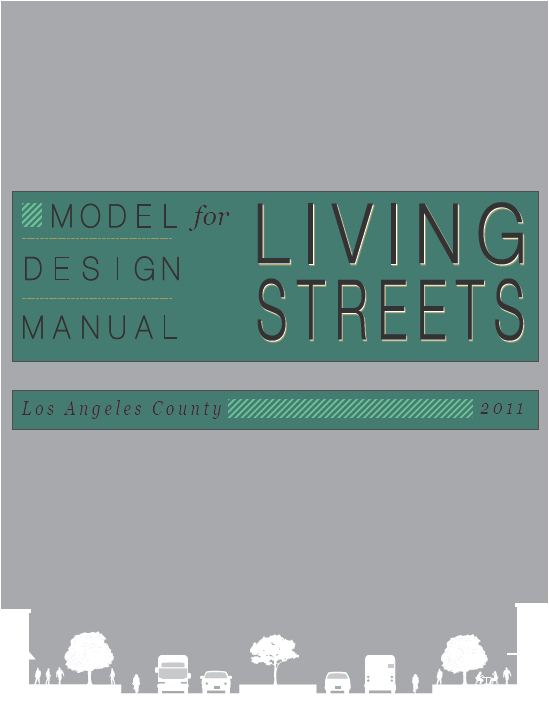 The Model Street Design Manual was created during a 2-day writing charrette, which brought together national experts in living streets concepts. This effort was funded by the Department of Health and Human Services through the Los Angeles County Department of Public Health and the UCLA Luskin Center for Innovation. This manual focuses on all users and all modes, seeking to achieve balanced street design that accommodates cars while ensuring that pedestrians, cyclists and transit users can travel safely and comfortably. This manual also incorporates features to make streets lively, beautiful, economically vibrant as well as environmentally sustainable. Cities may use this manual in any way that helps them update their current practices, including adopting the entire manual, adopting certain chapters in full or part, modifying or customizing chapters to suit each city’s needs. See the Customization section below for additional information. The download page features different file formats in order to simply the editing and customization process. Please notify this page, using the drop down menu on the right hand panel, if you adopt the manual in full or in part. Since many municipalities lack the resources to undertake a major revision of their manuals, this model manual offers a template for local jurisdictions to tailor to meet their specific needs. Additionally, to lower the cost-burden to cities, the manual there are recommendations to maximize benefits and minimize costs associated with street design. Vital streets, innovative parking policies, and desirable neighborhoods resulting from living streets can increase revenues for the cities above current levels. Research finds that cities often experience increased economic development after adopting elements of living streets. If you have any questions, comments, please use the contact form on the right hand-side of this page.